May saw a number of new subscribers come into the fold, and we are thrilled to have them join our friendly monthly contest. Some folks found us on literally the last day of the month and made impressive eleventh-hour strides up the leaderboard. In the end, it was longtime solver Jamie of Montgomery, Alabama, who amassed the most jugs (65), largely thanks to his deft handling of the misdirection puzzles. Bravo! This is a repeat victory for Jamie, who took the top prize back in December. 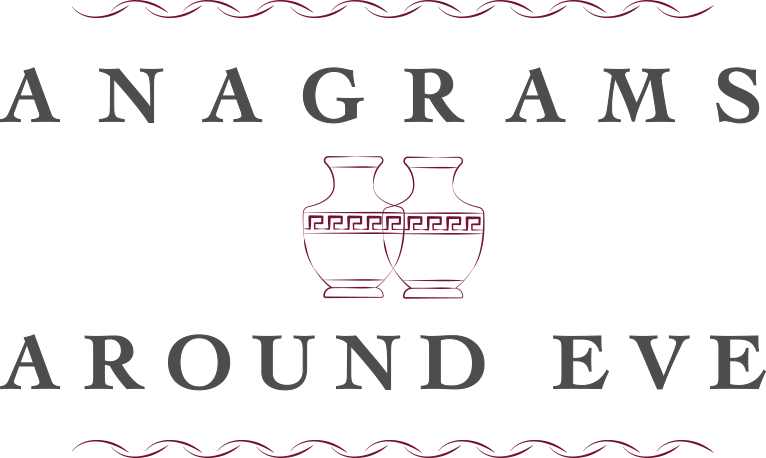 As he has already won a set of Triunes, Jamie will now receive a custom word puzzle of his choosing, as well as an Anagrams Around Eve notepad. Congratulations! to these skillful and lucky solvers, and a warm welcome to those winning notepads for the first time. I’ll leave you with some beautiful and staggeringly old amphorae that I was fortunate to have come across recently at the Archeological Museum in Heraklion, Crete. These both hail from Crete’s Minoan civilization during the so-called “New Palace” period, roughly the 16th Century BC. The Egyptian influence is particularly marked in the one on the right, whose design features griffins. They are also quite larger than they might appear in this picture, nearing four feet in height.